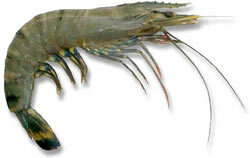 The black tiger prawn (Penaeus monodon) is a fast-growing tropical to subtropical marine species suited to water temperatures between 25°C and 30°C. It occurs in commercial quantities along the Queensland coast between Townsville and Cooktown. Prawns are normally grown in earthen ponds next to river estuaries. Most ponds are about one hectare in size and have a gently sloping bottom to allow for drain harvesting of the prawns and full draining for a dry-out period between crops. Pond depths vary from 1.5 to 2.0 metres. 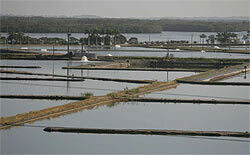 In 2001-02, nine prawn hatcheries in Queensland produced an estimated 352 million postlarvae. About 201 million post larvae were sold with a total value of sales of $3.27 million. Almost all the farmed Black Tiger Prawns produced in Queensland in 2001-02 were sold on the Australian market. Around three-quarters were sold interstate, 1 per cent exported, and the remainder sold in Queensland. Prawns are normally grown in purpose-built earthen ponds adjacent to the estuarine parts of river systems. Most ponds are about one hectare in size and have a gently sloping bottom to allow for drain harvesting of the prawns and full draining for a dry-out period between crops. Pond depths vary from 1.5 to 2.0 metres. Prawn larvae are produced in hatcheries which use wild caught breeding stock. Each spawner will produce between 200,000 and 500,000 eggs. The eggs are hatched and pass through a number of larval stages until they reach the post larvae stage. The post larvae prawns are normally sold to the growout farms for stocking ponds when they are 15 to 20 days old. Before filling, lime is added to the ponds to encourage plankton growth and reduce disease problems. The ponds are filled through screened inlets, fertilised with both organic and inorganic fertilizers and allowed to stand for 7 to 10 days to allow plankton to grow. Over four weeks the diet ofpost larvae prawns is changed from plankton to manufactured feed . Prawns are fed 3-4 times per day with the last feed being given close to dark. Feed is blown into the pond using an engine driven blower. Stable pond conditions and good water quality are necessary to maximise survival and growth rates. Paddle wheels and air pumps are normally used to aerate the water. The aeration produces a current causing the sediments to gather in the centre of the pond. This maintains a clean feeding area around the pond edge. Wastewater is removed from the bottom of the pond and drained into sedimentation or treatment ponds before being reused or released to the environment. The prawns, at around 25 to 35 grams each, are usually ready for harvest in 120 to 150 days, depending on stocking rates and water temperature. 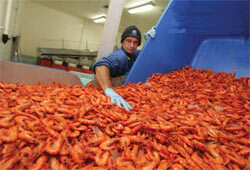 Prawns are washed, graded and generally cooked before marketing. Some prawns are sold raw (green) and others are individually quick-frozen for storage and sale at a later date.